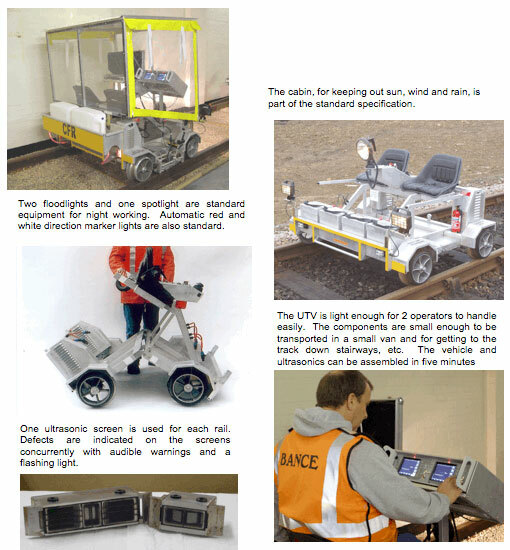 The Ultrasonic Test Vehicle (UTV) is now 15 years old but is still the most recent development in the non-destructive testing of rails. It was introduced because it is more cost efficient, reliable and user-friendly. It offers greatly improved productivity over the manual system (about ten times), and has been designed so that operators familiar with manual ultrasonic detection systems can easily adapt to the UTV with a minimum of training. It operates at much the same speed as road-rail machines, but is less expensive and easier to operate. Whilst compared with “high speed” testing it gives better results and the considerable benefit of immediate verification of defects at a fraction of the cost. 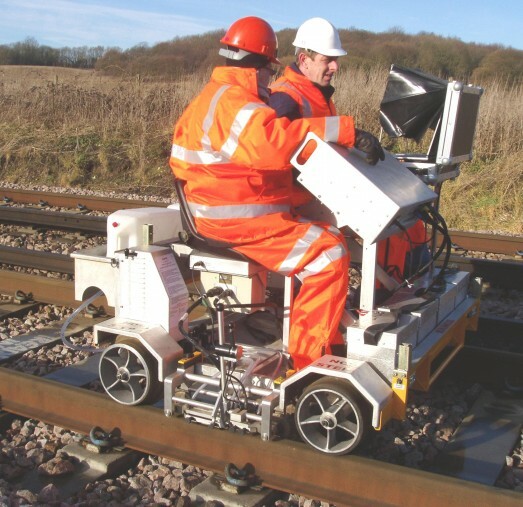 The system has been developed in conjunction with on-track operators, and consists of a specially designed battery-powered lightweight Alumicart fitted with proven digital ultrasonic instrumentation. The system is available with a choice of sliding probe packs or wheel probe packs with multiple 70/70/70/70/70/70/38/38/0 transducer arrangement. The UTV operates at any speed up to 16 Km/h. It scans both rails simultaneously and bi-directionally, so that a single pass on the UTV scans both rails in both directions. Once a defect is detected the operator reverses the UTV back over the affected area for confirmation of size and type of defect. A-Scan and B-Scan images are recorded and the location is derived by GPS and automatically recorded on the laptop. Further details concerning the defect are entered as required. No further manual testing should be required. The design and quality of the ultrasonic equipment allows defects to be identified at an earlier stage than existing manual systems. The information from the scan is stored on disc, and thereby a comparison of succeeding scans over a period of months enables the growth pattern of defects to be monitored; this allows for advance programming of the removal of defects and so reduces costly emergencies. A laptop computer is used for continuous recording of rail depth as well as recording of defects and platform gauging if required. Sliding solid state probe packs are used for long life accurate results. Wheel probe pack containing 70/70/70/70/70/70/38/38/0 transducer arrangements as standard. Any transducer arrangement can be facilitated. The vehicle is designed for long life in a railway environment and can carry up to half a tonne. Electric traction is used because it is vibration-free, almost silent, very reliable, and requires minimal maintenance. It is driven by two electric motors, which are powered by long-life, maintenance free, heavy-duty traction batteries, which provide 8 hours running (» 50 Km). The chassis is constructed from welded aluminium tube. There are dual failsafe/parking brakes, which operate immediately the vehicle comes to a halt or in the event of a power failure. If the vehicle needs to be moved manually the brakes can be isolated. Batteries are 90 per cent charged in 10 hours on or off the vehicle. Through the use of quick-release connections the components of the UTV are assembled and made ready by two operators in about five minutes. The vehicle is constructed to Railway standards for structural and operating performance. It is designed as much for night working as day working; it has halogen headlamps to light up the track, red and white running lights which change automatically according to the direction of travel, and a cabin inside light. Two digital ultrasonic sets are used independently, one for each rail housed together as one unit. The signals to them are transmitted by solid state sliding probeheads or wheel probeheads, which are automatically centred on each railhead. To eliminate air between probehead and rail, water is used which is carried on board and fed automatically to front or rear according to direction of travel.